Hiring confidence for the first quarter of 2017 is strongest in Taiwan, India, Japan, Hungary and Slovenia, while employers in Brazil, Switzerland and Italy report the weakest hiring intentions. 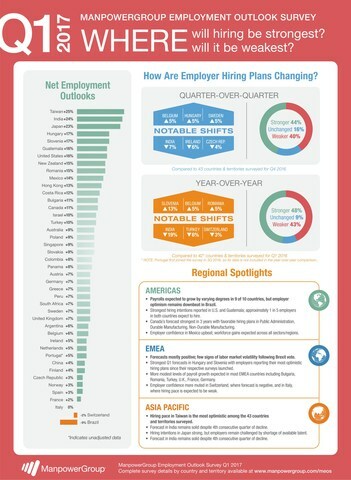 Employers anticipate steady and continued hiring in spite of ongoing geopolitical uncertainty, according to the latest ManpowerGroup Employment Outlook Survey released today. Of almost 59,000 employers interviewed globally, 40 of 43 countries and territories anticipate increasing staffing levels in Q1 2017. Hiring prospects strengthen in 19 of 43 countries and territories, compared to Q4 2016, are unchanged in seven and decline in 17. When compared with the same period last year, hiring intentions improve in 20 of 42 countries and territories*, decline in 18 and are unchanged in four. EMEA: Employers expect staffing levels to increase in 23 of 25 countries in the EMEA region in the next quarter. The strongest EMEA Outlooks are forecast by employers in Hungary and Slovenia, while the weakest Outlooks are reported in Switzerland and Italy. Asia Pacific: Employers in all eight Asia Pacific countries and territories expect increased hiring during Q1 2017, though hiring expectations vary widely. Taiwan’s employers report the region’s strongest first-quarter hiring intentions as well as the most optimistic Outlook among the survey’s 43 participating countries and territories. The weakest Asia Pacific hiring intentions are anticipated in China. 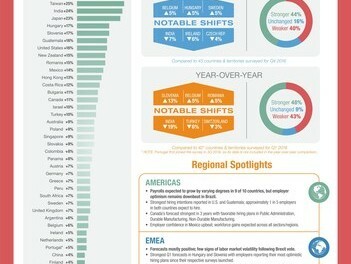 Americas: Employers in nine of the 10 Americas countries expect to increase staffing levels during the next three months, with employers in the U.S. and Guatemala reporting the region’s most optimistic hiring plans. The weakest hiring activity is forecast by employers in Brazil. To view complete results for the ManpowerGroup Employment Outlook Survey, click here. The next survey will be released 14 March 2017 and will report hiring expectations for Q2 2017. To receive the latest survey results each quarter, sign up at www.manpowergroup.com/meos. *Portugal joined the survey in Quarter 3 2016 and has no year-over-year trend data to compare at this point. ManpowerGroup® (NYSE: MAN) is the world’s workforce expert, creating innovative workforce solutions for nearly 70 years. We connect more than 600,000 people to meaningful work across a wide range of skills and industries every day. Through our ManpowerGroup family of brands – Manpower®, Experis®, Right Management® and ManpowerGroup® Solutions – we help more than 400,000 clients in 80 countries and territories address their critical talent needs, providing comprehensive solutions to resource, manage and develop talent. In 2016, ManpowerGroup was named one of the World’s Most Ethical Companies for the sixth consecutive year and one of Fortune’s Most Admired Companies, confirming our position as the most trusted and admired brand in the industry. See how ManpowerGroup makes powering the world of work humanly possible: www.manpowergroup.com.